It should come as no surprise that the Michigan deer population is sizable. In fact, there are close to two million deer wandering the forests of this state and each year, nearly 50,000 reported vehicle-deer crashes are reported. About 80 percent of these crashes occur on two-lane roads between dusk and dawn. While there are precautions to take to avoid a deer-strike collision, we have also outlined the proper protocol to follow should you end up in the less fortunate scenario. Deer are most active (and likely to be near roadways) right before and after sunrise and again from sunset until midnight. If your schedule is such that you find yourself on the road during these drive times, be advised and take extra precaution — including paying attention to road signs indicating animal crossings, which have been strategically placed in specific locations known to officials and identified as high-traffic areas for deer. If you drive during peak early morning or evening hours, ensure your headlights are on and use high beams as appropriate with oncoming traffic. In addition to generally aiding visibility, headlights can reflect off an animal’s eyes, making them easier to spot and avoid. Keep in mind that if you happen to spot a deer in the woods or a field adjacent to the road, it is likely that there are other deer close by. Another precaution that may seem obvious but could put you at a lower risk for collision with a deer is speed. Particularly in highly populated wildlife areas, be extremely mindful of local speed limits and maintaining the designated speed. The slower your speed, the less distance it takes for your vehicle to stop. Despite your best efforts and intentions, you may find yourself in a situation where it becomes impossible to avoid a collision with a dee. If you do manage to spot a deer in your path, try to hit the horn; a single, long blast is recommended for startling an animal enough to encourage them off the road. If your horn does not compel the deer move, or you are unable to react in time, try to hit your brakes and do not try to swerve. Stay in your lane, even if it means striking the deer. According to the Michigan State Police, the most serious crashes occur when motorists swerve to avoid a deer and subsequently hit another vehicle or a fixed object, sometimes causing their vehicle to roll. When and if possible following a deer collision, if you can safely maneuver your vehicle (contingent upon the damage and severity of the crash), put your hazard lights on and pull over to a shoulder or roadside — stay as far out of the way of oncoming traffic as possible. Do not leave the scene; call the police to report the incident and to have them assist in the assessment of the damage. It is actually a misdemeanor in the state of Michigan to leave the scene of an accident, including deer collision. It is also recommended, if and as it is safe to do so, to document the incident however you can; take photographs of the roadway, your surroundings, damage to your vehicle, and any injuries you or your passengers sustained. If witnesses stop, take down their account of what occurred, and ask for contact information. This can be beneficial to you and your records for in insurance claims. Keep in mind that unfortunately, a collision with a deer may not always result in the death of the animal. 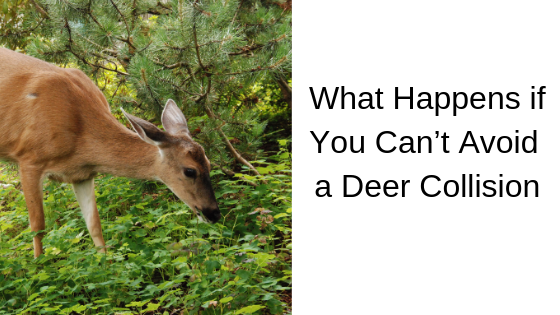 It is possible to cause injury that leaves the deer stunned or incapacitate. In these cases, it is important that you, your passengers, and any passers-by stay away from the animal. A frightened, wounded deer could use its powerful legs and sharp hooves to harm you. Never assume that your vehicle is still safe to drive, even if it appears to be in normal condition. Following a crash, it is important to look for and consider leaking fluid, loose parts, tire damage, broken lights, a hood that won't latch and other number of other “invisible” safety hazards. If your vehicle seems unsafe in any way, call for a tow. Once you are safely at home, take your police report, witness statements, notes, and photographs and contact your insurance company. They will require proof that you had a collision with a deer in order to fully cover the damages. Failure to provide this information may mean you may have to pay for the deductible to repair the damages. Of course, the best advice and ideal scenario is to avoid a vehicle/deer collision altogether. Be exceptionally aware especially during morning and evening hours and do not assume that just because you’re on a residential street that striking a deer is highly unlikely, as it is not. In fact, drivers are three times as likely to strike a deer on a residential street as they are on a state route. So “keep your eyes diligently peeled,” so to speak, and be constantly aware of the dangers that deer possess, specifically during this time of year.